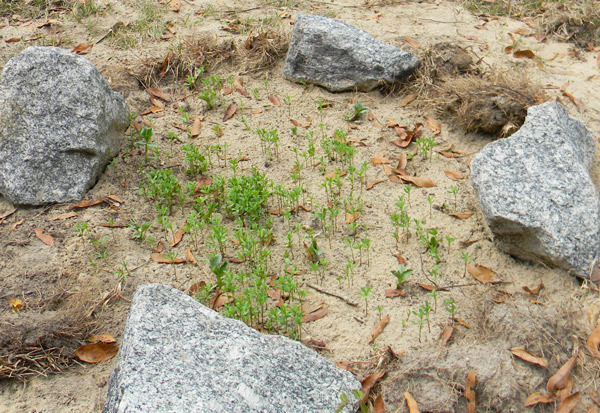 Florida Survival Gardening: MELON PITS!!! Okay, so I've taken to calling my in-ground hugelkultur experiments "melon pits." That's because I'm punching these 3' deep holes into my front yard food forest in the hopes of growing melons in them this summer. Of course, the holes don't stay 3' deep. 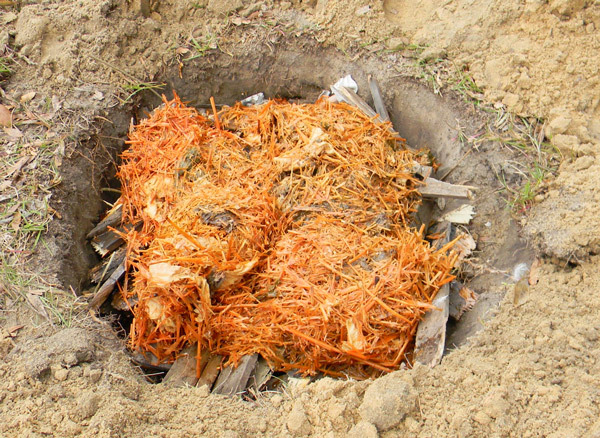 After the tough work of digging, I fill them with a mix of wood, moss, leaves, waste paper, bones, organic debris I rake from the chicken yard, raw manure, straw, biochar, etc. 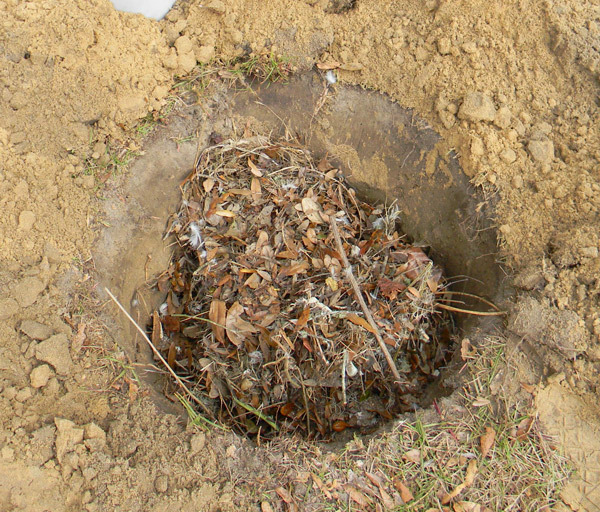 Here's my process: the first thing I did was dig a pit, then throw in some chicken-yard debris or waste paper. 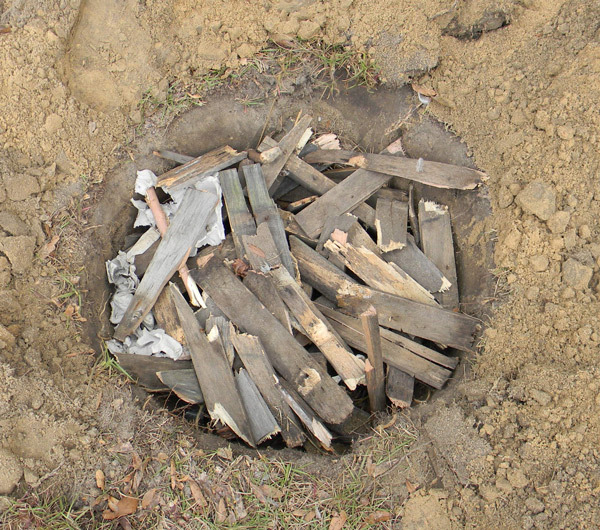 Then, I dumped in sticks, pieces of logs, or, in this case, busted-up pallet wood. After that, a generous helping of raw manure and urine-soaked straw. Then, I gave the whole thing a good soaking with the hose. Followed by a planting with cool-season nitrogen fixers. Lentils, chick peas and fava beans. I found it quite encouraging that a few weeks after I started on this project, Leon posted the results of his own experiment with burying phone books. I hope that this summer I will in fact grow some melons (and squash!) in the front yard. I've had problems getting the more tender plants through the hot and dry months before the summer rains kick in. I'm praying this is the answer. I've already put in 4 or 5 of these out front between the young fruit trees. 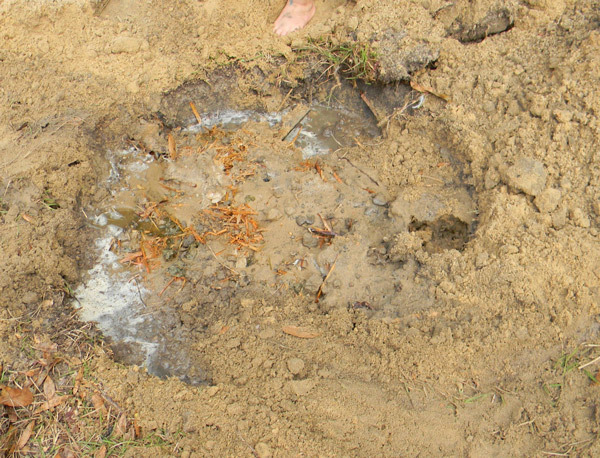 I suppose at the very worst, I've simply loosened and spot-fertilized what was previously almost worthless sand. Grocery store. I'm a total cheapskate. The fava beans came from an Indian market. If you try it, please let me know how it goes. This is all experimental right now. Thanks for the reminder. Went to the grocery store tonight, came back with 2 bags of the "French bean soup mix", which has about 15 different types of beans, including lentils and garbanzos. Also bought some raw redskin peanuts, and they had a 2-for-1 deal on a variety bag of little soup potatoes, about 5 varieties. All going in the ground ASAP. Nice. I love those bean assortments. When planted, you can't figure out what the heck kind of varieties you're growing until they get big. Incidentally, I've been told that most commercial potatoes are sprayed with sprout inhibitors to keep them from growing eyes on the shelf. I've had decent luck despite that. One garden I did in TN was planted solely with a mix of red, white and yellow potatoes I found while dumpster diving. Heh. My very best luck, however, has been with using organic grocery store potatoes for seed stock. I figured those weren't treated with any kind of sprout inhibitors and it seems I'm right. I got last year's blue potatoes from the organic market. Cheaper than through the mail. Hmm... hadn't thought of that, dang it. Don't worry about it too much. Put some potatoes on a sunny windowsill and observe their growth. If they start rapidly producing eyes, you're okay. We're talking a week or so. If they just sit there and green up and the eyes grow slowly, it's a wash.